HA!!! Every time someone in our family says, "Hey now" ... someone HAS to finish it with ... "Get your game on, go play ... hey now, I'm an All Star!" ... Lol!!! :) I loveeeeeeee this! The colors are sooooooooo fun!!!!! Your cards look always so perfect, Lisa ! You did great with the boy theme ! Fantastic card, Lisa, love the use of the what, when, and where stickers! I think you can create with any line. This is so fun! How cool! Really masculine and awesome! What a fun card! 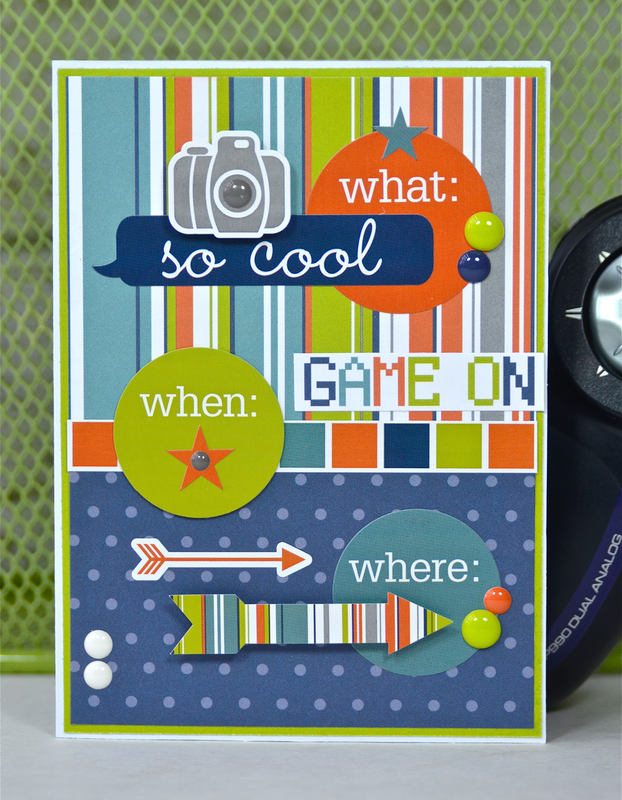 Love the arrows and the little camera! Love those colors. What a beautiful fun card. Great card! Love how you were inspired to create it!! WOW - it did not seem to matter that you don't craft boy cards very often cuz you definitely got your game on with this cool card!! Either one of my sons would think this was the coolest card ever - So looking forward to your other two cards for this week!! You always impress and inspire!! Awesome card, Lisa! Great use of the collection! !